Reading striker Nicholas Bignall has signed a new contract to keep him at the club until the summer of 2012. 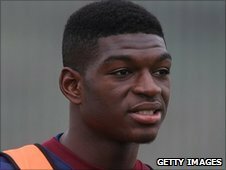 The 20-year-old, who is on loan at Southampton for a month, is a product of the Royals academy and signed a two-year professional deal in 2008. He has scored two goals in four games for Reading. Director of football Nick Hammond told the club website: "He is a promising young player and we are hopeful he can make an impact here." He added: "He's one of a number of players to come through our academy, he's been in and around out first team and with the benefit of loan moves that can help him make the next step. "He's at a good club in Southampton and we're keen to see him continue to do well." Bignall added: "I'm very happy to be continuing my career at Reading. I think they see me as a player for the future so it's up to me to roll into those shoes and try and fulfil what they see in me."